From Saxon times the Bishops of Hereford were Lords of the Manor of Bosbury. When they visited to hold court, to collect revenues, and to hunt, they stayed in the manor house or palace. Two Bishops died in Bosbury: Athelstan in 1056 and Richard Swinfield in 1316, but the only evidence of a church from early times is the crude stone bowl believed to have been the font. The oldest part of the present church is the west wall. In it can be seen the outline of the Norman church, perhaps of the early twelfth century. The church itself was about as large as the present nave, but about eight feet (2.4m) lower. By 1200, side aisles and a clerestory had been added and, perhaps a little later, the new chancel. The main work was probably done during the time of William de Vere as bishop (1186-1200). He had rebuilt the Great Hall of his palace in Hereford and although it was framed in timber, its outline and dimensions were strikingly similar to those of Bosbury’s new church. The first written record of the church is a charter of 1200 by King John. It names the first priest about to be appointed and speaks of him holding office “as fully and freely as any of his predecessors” confirming that there was already a church here. Late in the thirteenth century the palace was rebuilt north of the church where Old Court Farm now stands. The gateway survives today as part of the hop kilns, and is visible from the lane to the east of the church. It was a favourite palace of the bishops and was one of the seven still used after the mid fourteenth century: before that time the bishops had enjoyed the use of 21 palaces. Records exist of a visit, lasting 51 days, in 1291 by Bishop Richard de Swinfield with a household of about 40 people. Rituals became more imposing and architecture more adventurous during the fourteenth and fifteenth centuries. As a more fitting setting for this richer worship, the narrow lancets in the east wall of the chancel were replaced with the single large perpendicular east window. A Rood screen, separating chancel from nave and surmounted by a Crucifix (a “Rood”) became a common feature. Bosbury’s dates from the late fifteenth century. It is a very fine example of fan vaulting in timber and one of the church’s most noteworthy features. 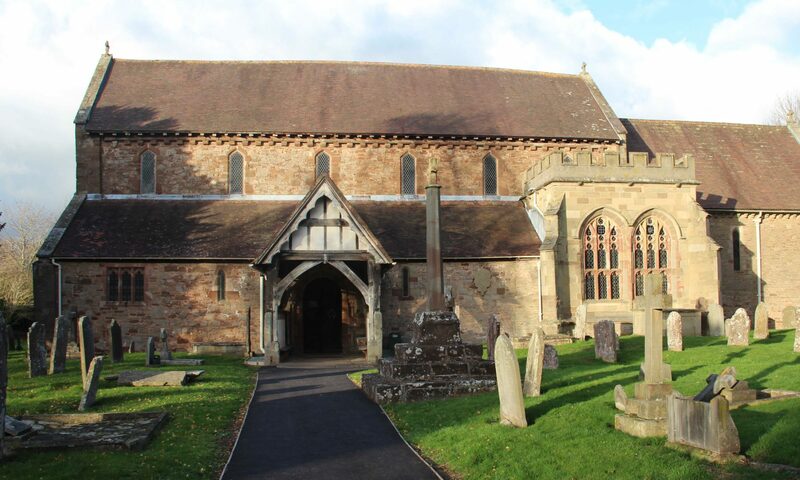 In 1503, after the bishops ceased using the palace, it was leased to Thomas Morton, Archdeacon of Hereford, and his brother Sir Rowland, newly arrived in Bosbury. There were said to have been brothers (but are more likely to have been nephews) of the celebrated Cardinal John Morton. As Archbishop of Canterbury (1482-1500) he had been responsible for the great central tower (“Bell Harry”) there. The Morton chantry chapel was formed in the south aisle of Bosbury church in order that masses might be said in perpetuity for the soul of Sir Rowland’s wife who died in 1528. With the large Perpendicular windows and rich fan vaulting it draws its details from “Bell Harry” and also from Bishop Stanbury’s chapel in Hereford Cathedral for which Thomas had been responsible, and it concedes nothing to the simple Transitional church with which it can only be said to have collided. Great changes were impending. Renaissance architecture supplanted Gothic. The Reformation led, in England, to the establishment of a new church, independent of Rome, with its scriptures and liturgy in its own tongue. Roods, as symbols of Popery, were removed from their screens and chantry revenue was confiscated. Sir Rowland lived to see these things happen – he died in 1553 – but he was allowed to divert the chantry revenues to the founding of a boy’s grammar school, in 1540. The building, now much altered, is in the northeast corner of the churchyard. Next to leave their mark on the church were John Harford (d. 1559) and his son Richard (d. 1578) who became, in turn, stewards of the bishop’s manor and are reported to “have enriched themselves in dealing with the church property”. Their memorials are indeed rich. These lie on either side of the alter and are in the new Renaissance style. John’s erected in 1573, is signed by John Guldo of Hereford. That to Richard and his wife Martha (d. 1601) facing it, is similar in outline but much less refined and, being later, is probably not by the same hand. Early in the seventeenth century the church gained its present lectern and pulpit, both Jacobean in style. The pulpit has been greatly changed and restored, but its carvings of Biblical themes are believed to date from the late sixteenth century. During the Civil War, in the mid 1600s, Parliamentary troops, with their Puritan zeal for simplicity in worship, set out to destroy all Popish symbols and undo decoration. In Bosbury they broke all but a few panes of stained glass in the Morton Chapel and also the stoup of holy water in the south porch. According to local tradition they nearly demolished the preaching cross in the churchyard. Over the centuries, other agents of destruction and of change also played a part. Lightning struck the spire in 1638, the north side of the chancel arch subsided in 1859, a fire destroyed the west of the roofs of the nave and south aisle in 1917 and there was probably some neglect. Many repairs and alterations were made in the nineteenth century, including replacing many pews, tiling the aisles and chancel, and installing and later removing a west gallery. The church escaped the drastic over-restoration fashionable in the period, but the chancel was largely rebuilt in 1871 and a small north transept was formed to house the new organ. In 1921 the baptistry was moved from the west end of the nave to the south aisle and the present vestry and inner porch were formed. The altar was moved forward in 1980 and in 1987 the Morton Chapel was extensively restored. The church has no memorials to ancient aristocratic families – the landlords have been the bishops, and since 1848, the Church Commissioners. But to fighting men, there are two slabs in the south arcade marking the burial of Knights Templar. Their order was much involved in the Crusades and they maintained a Preceptory (a branch) at Temple Court nearby. There is one memorial to a casualty in a nineteenth century war: to Arthur Clynton Baskerville Mynors, who died in Natal in 1879. The village war memorial lists 60 men (from a population of about 850) who fought in the First World War of whom 18 died. Their names, with those of six from the Second World War, are on the panelling at the west end of the nave. This was formed from part of the old pews. The east window commemorates the family of the Revd Edward Higgins who lived for over 50 years at Bosbury House. It was made by Wailes in 1882 and shows the four Evangelists and below them, the Presentation in the Temple and the Blessing of the Little Children by our Lord. Four of the recent memorials have been to women. The west window (St Cecilia and Dorcas) is to Mrs Ellen Hope (died 1880), donor of the organ. The panelling in the lower part of the chancel screen is to the progressive novelist “Edna Lyall” (Ada Ellen Bayly, died 1903) sister of the Vicar at the time There is a plaque to Mrs Elizabeth Mutlow Homes (died 1926), a manager of the Girl’s School, and the window behind the pulpit (St Michael) is to Mrs Marian Buck (died 1947) a generous local benefactor.